from July 29 to August 1, 2012. USBI director Gloria Flora notified the Sonoma organization of the Advisory Board selection. Sonoma was selected for its practical, enterprising focus on Biochar opportunities, the abundance of agricultural partners in the region and the County’s national standing as a leader in addressing climate change. 2012 US Biochar Conference is designed to advance our understanding of the economic, science and policy issues related to biochar as both an amendment for soils as well as agent for carbon sequestration. California’s reputation for progressive policy and venture capital resources provide an excellent setting for showcasing new innovative technologies like biochar. Bio-char with David Yarrow from mediasanctuary on Vimeo. Micheal Palace has been kind enough to share the attached poster with some of his initial work detecting Amazonian dark earths (called ABE in the poster) using satellite images from NASA's Hyperion spectrum scans of the Amazon region. The team of scientists working on the technology have been correlating archeological evidence of the Dark Earths (ABE) and the Hyperion scans of the same areas to see if they can find a way to reliably use the scans to detect other areas of Amazonian Dark Earths. Ultimately, they'd like to use the Hyperion data to find the extent of the dark earths in the Amazon basin, and be able to provide archeologist with the statistical likelihood that there are actually ancient dark earths in the areas indicated by the scans. Arborists in Chicago are studying the results of biochar on trees growing in urban soils that are typically hostile to trees. This research is part of a larger urban-soils study that includes applications of biochar in greenhouse and field plot settings at The Morton Arboretum. The Bartlett Tree Research Laboratories have also been testing adding biochar to the soil mix when planting trees. More information and media coverage of this study about biochar and urban tree care can be found on the Bartlett Tree Experts web site. From the picture it appears that they are drilling holes and side-dressing about 60 existing trees in the Wicker Park/Bucktown community. The application started this year and the study will continue for the next two years. All trees were aerated with the same number of holes – no matter the treatment. 100% biochar was applied. This was applied by itself, in combination with fertilizer and a fertilizer only treatment was also applied. Control trees only were aerated and immediately backfilled with the soil from the hole. Biochar was applied at a rate of 1/8 pound dry weight per square foot surface area. I have been making a LOT of charcoal using the PYROMID method: Stack up a lot wood (as from cutting up a brush pile for instance) in a DENSE pyramid, any size. Use tinder to light the apex of the pyramid at the top. 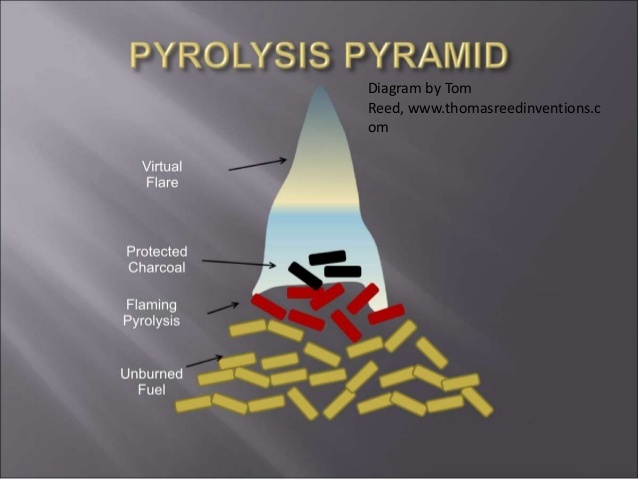 The reaction zone will quitely ignite layer after layer with the upper layers of charcoal protected from burning by the expanded layer of deoxygenated ("dephlogisticated") gas rising by natural convection. Avoid windy days that would blow the protective gas sideways. Stand by with a hose of watering cans to wet any char that extends beyond the protection and to put out the whole pile when done. After you think it's out, think again because small embers can hide and come alive again. See the attached Soil Food Web Insights Newsletter for the full report, and check out their web site, http://soilfoodweb.com/ for more information. The biochar concept has challenged scientists to figure out the best approach to turning waste organic material into stable carbon. This exciting new development has attracted the attention of researchers like John Miedema. atmosphere. He’s also concerned about devising new methods to feed the population of the world. 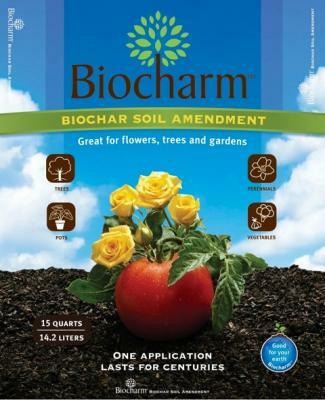 Biocharm™ comes in 15-quart bags and is ready to be mixed into garden soil. 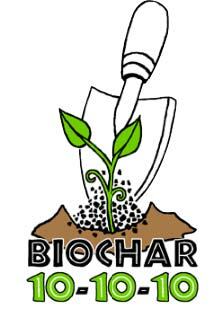 BIOCHAR as a soil amendment serves to enhance plant growth and sequester carbon. Green Liquid and Gas Technologies is one of the few U.S. producers of a pyrolysis device to convert biomass into biochar while providing small scale waste-to-energy services for a farm or business. is converted to energy and biochar and the on-site and global benefits.